I think it’s common knowledge that when you’re buying meat at a grocery store, the chances are high that the meat comes from animals that have been given feed that isn’t part of their natural diet, likely abused or at least lived in very crowded quarters, and given hormone, antibiotic and/or vaccine injections. I started looking at my hometown of Edmonton to see what was available in the area for free range grass fed meat. I had the opportunity to get in touch with Mike L’Heureux from Blue Copper Ranch and he offered to give my family a tour of his farm and cook us a steak dinner to see how the beef he offers tastes! 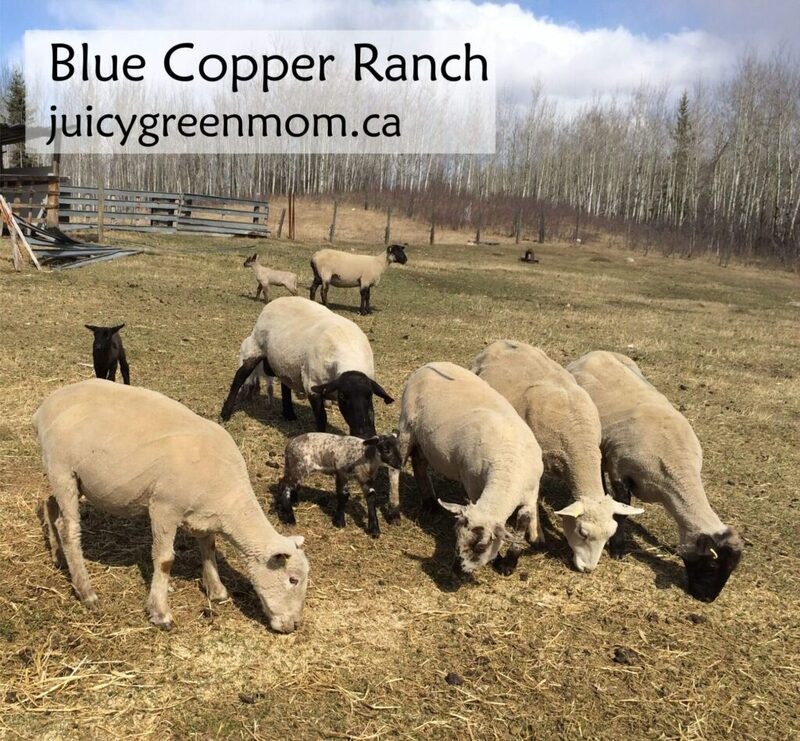 Blue Copper Ranch is a small family farm located about 1 hour outside of Edmonton, near Barrhead, AB. Mike and his wife Candace have chickens, sheep, llamas (to keep the coyotes away from the lambs), pigs, and cows on their farm. The first thing I noticed when we arrived was the huge open space. They don’t have hundreds of animals, they have a few, so their animals really have the luxury of being truly “free range”. The farm looked very much like what I would imagine a family farm to look like – without the accoutrements of profit-driven industrialization. Simple fences and small structures to provide shelter were the only things I saw that would keep the animals contained. My daughter was excited to run after the chickens all around the farm. 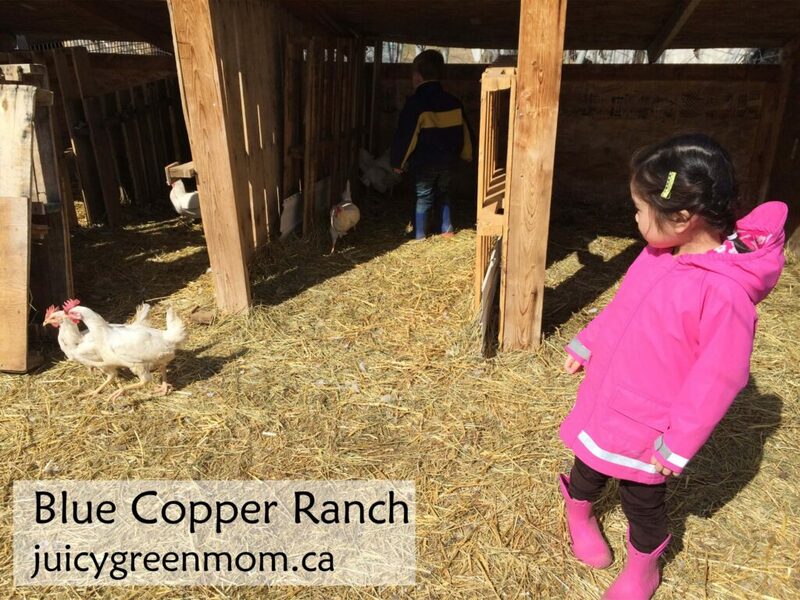 She was thrilled when Mike offered to show her where the chickens hid to lay their eggs (they could be anywhere since they have free range of the farm!). 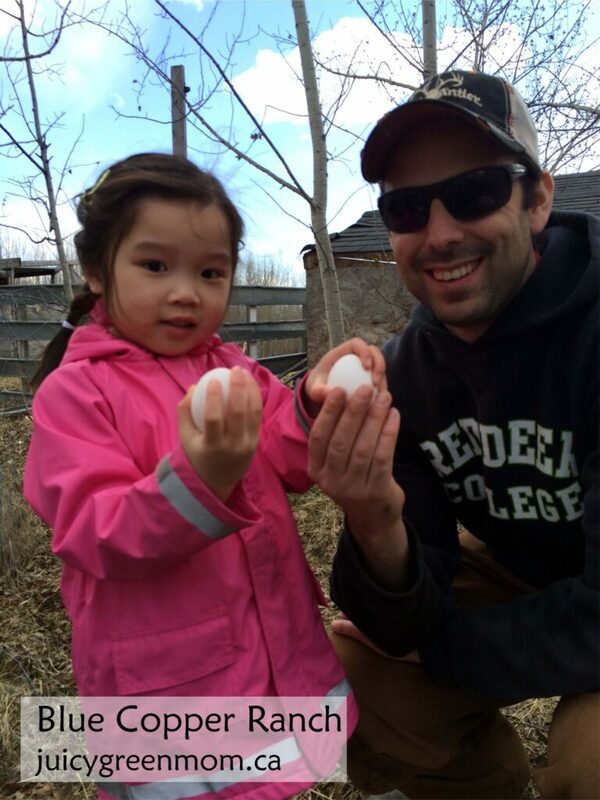 It was a real-life Easter egg hunt for her! We visited the farm in late April, which is lambing season. What a thrill for us to see beautiful little baby lambs! So so cute! The mama sheep were all just sheared for spring (they get sheared just once a year), and I was somewhat shocked to hear that their wool isn’t worth much as they are not the right type of wool-breeding sheep (I wonder if it would be any good in the DIY wool duvet I made for my daughter’s green big-girl bed!). Mike constructed some stalls for the ewes to bond with their newborn lambs for the first few days after birth. The ewes and lambs are all in open pasture where they graze as much as they want. In the winter, the ewes are fed hay as they don’t have access to fresh forage. During lambing season, both the ewes(pregnant and nursing) and lambs are also given a barley-based nutritionally-balanced feed to ensure they have adequate nutrition. Salt lick blocks (solid mineral blocks that the sheep lick) are also placed around for easy access to provide essential nutrients. Mike informed me that 1 ewe typically eats 1 bale of hay over the winter, and that the optimum ratio for lambs is approximately 1.5 per ewe. Lambs are typically slaughtered somewhere between 4-8 months of age. Mike had a few pigs set up on another pasture that are given swine feed and hay, along with the grass they’re on. As with the sheep and cows, they change pastures often to ensure the animals are getting access to fresh grass. Mike keeps both full size and Dexter cows on his farm, which are a smaller breed of cattle known for their high meat and milk quality. Mike explained that they are about 3/4 of the size of other cattle, and therefore they have smaller cuts (meaning healthier portion sizes for families). Because all his cows are “grass-finished” (meaning they never get fed grain like the feedlot cows do close to butchering time), the beef is leaner and all the cuts are smaller than what you find in traditional grocery stores. Mike doesn’t raise calves from birth on his farm, but rather buys yearling calves from the auction, and keeps them until they are ready for butcher (usually a minimum of 3 months with most being closer to 6 months). This method keeps their costs down which they can then pass on to customers. 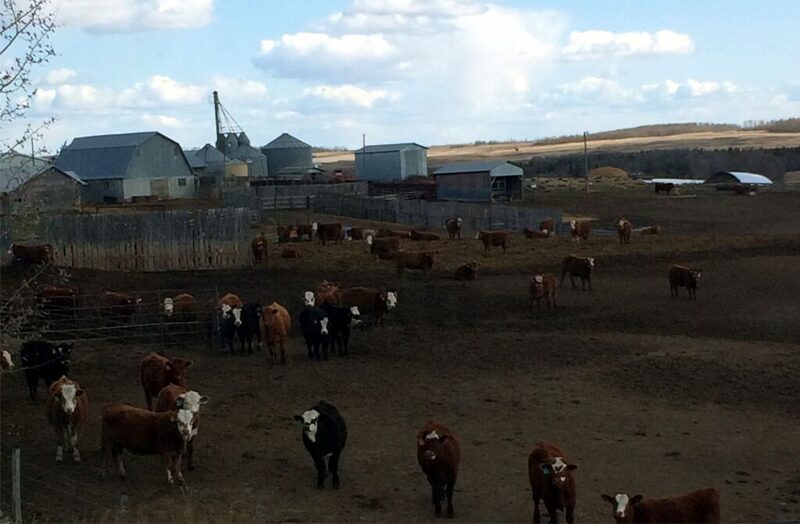 (If you’re wondering why these animals go to auction, sometimes the reason is that they are weaker or unlikely to do well in a crowded feedlot – but can do well on a farm like Blue Copper Ranch.) The pricing of their beef is between that of regular store bought beef and organic beef. When asked about whether pesticides are sprayed on their feed, Mike guaranteed that they do not spray any pesticides on his farm. He also stated that the majority of farmers don’t spray hay with pesticides because it isn’t worth it (and hay is what the young calves would eat until they get to Mike’s farm, and what they eat during the winter). It’s more likely for farmers to spray grain crops, however cows generally don’t get grain until they are getting ready to butcher. Since Mike keeps his yearlings grass-fed until they are butchered, there’s no worry about grain contaminated with pesticides. Mike drove me by a nearby feedlot to give me a chance to see how it was different from his own farm. What did I notice? There were WAY more cows on the land. And there was no grass – their pasture was all black. There were feed troughs along the side of the fence close to the road where grainis put for the cows to eat. Mike explained that feedlot animals get injected with hormones before they’re put in a lot to help them to digest the grain better and build more muscle (since grain isn’t a natural food source for them, and it’s used to make the cows heavier at butchering time). They also may be treated with vaccinations or antibiotics prior to entering the feedlot because they’re much more prone to illness when in a space with more animals in less space (think of your kids going to daycare or school and how many germs are floating around!). This particular feedlot didn’t look like it was overcrowded for the animals, but there were a lot of them. They all started heading towards the vehicle when we stopped to take a look, hoping we were going to give them some food! So what really stood out to me on my visit to this beautiful family farm? 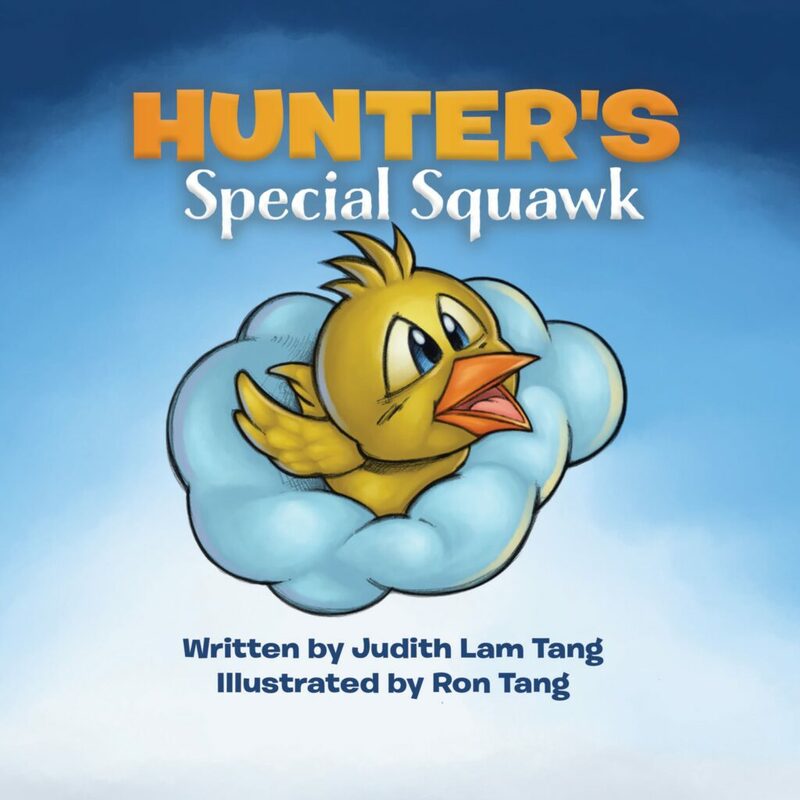 Mike and Candace really try to give the animals in their care the best possible life. They provide what the animals need, and do not use hormones, antibiotics or vaccines willy-nilly. However if an animal gets sick, they will treat it if needed to help it survive. That is something that I can understand and it’s satisfying to know that the animals are treated well. I’m definitely on the list for getting notified at butchering time (deep freezer, get ready to be packed!). The steak dinner we had was delicious and amazing – the meat really is super lean and has an excellent flavour to it (my meat-loving husband was in steak heaven). As a green family on a budget, I can certainly sympathize with those who honestly cannot afford to buy organic meat all the time. 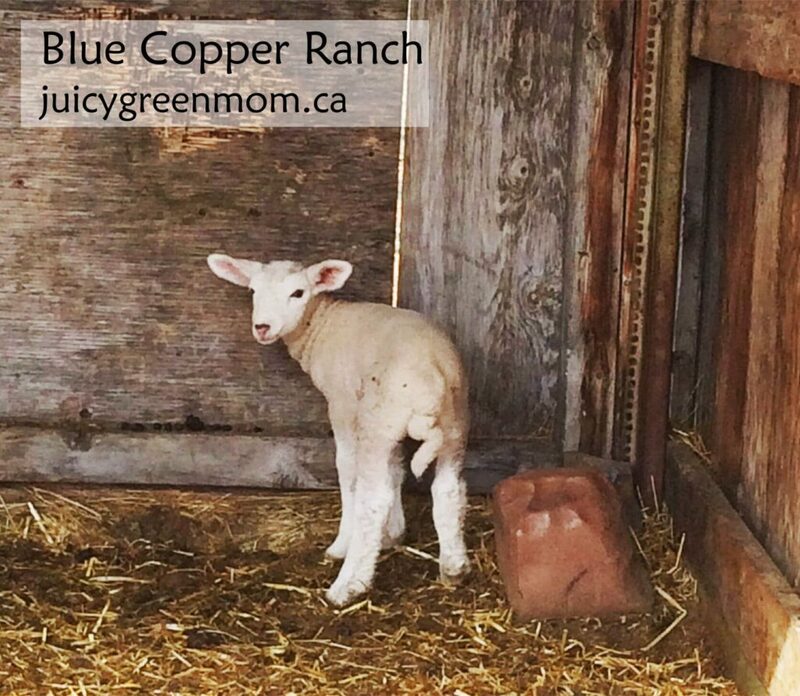 I think Blue Copper Ranch offers an excellent and budget-friendly alternative. I’ve recently been reading about the horrible conditions for pigs, poultry, and cows in factory farms. Nobody should be eating that. This post was a breath of fresh air. Very cute pictures! Thank you!! Yes, it was a beautiful family farm to visit! I am looking for a good deal first of all…. What would you charge me for a 1/2 side of beef, you cut and I will wrap?